Quilting Adventures: A Nor'Easter ...! Thank you everyone for your kind comments. It means a lot to me. As you all know, it is not easy to lose a pet. They are so much a part of our lives. Thank you for your thoughtfulness. We have a beautiful snow storm going on at the moment. DD and I have been out shoveling twice so far! I so enjoy a nice snow storm. 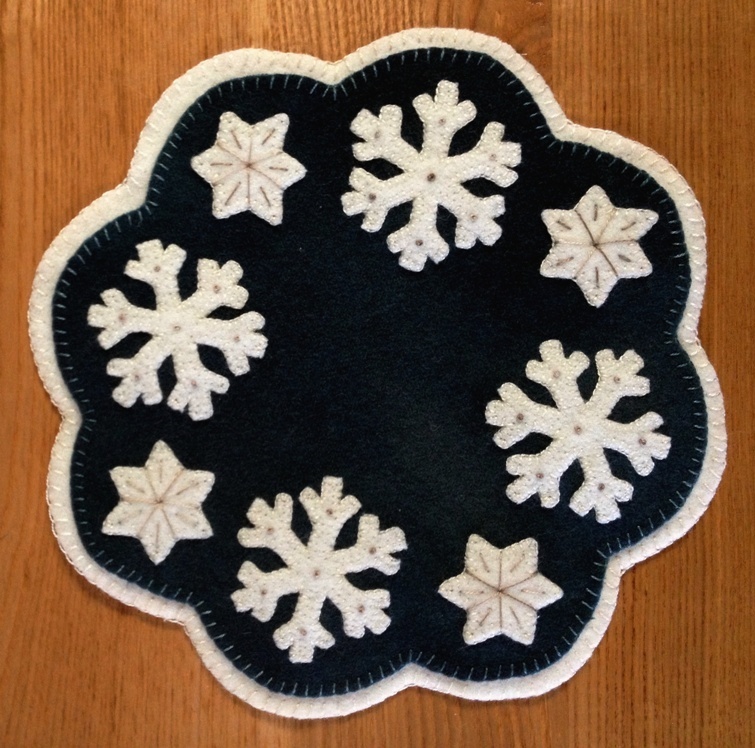 Speaking of snow, I finished the February - Penny Rugs thru the Year. Love, love, love, the snowflakes! Hope everyone in the storm's path are safe and cozy! I'm off to pour myself a glass of wine and sit by the fire for a bit! That is a perfect piece for today, lol. We have shoveled more than a few times, but it keeps coming back. Our vet called and my poor guy has gotten worse with his kidney failure, so will see how the weekend goes. I always enjoyed shoveling . . . . but I'm sure glad I don't have to do it anymore *s* Stay warm! The nor'easter arrived in our neck of the woods about 4 hours ago. The snow is falling quickly and the wind is howling creating blizzard-like conditions and a great day to stay indoors and sew or hook. Love your penny rug, Carole. My cup of tea for sure! Perfect timing on your penny rug! I hope you've managed to stay cozy and warm all weekend! What a week .... !